Galaxy Note 3 User Guide details the major features and their usage for your new Galaxy Note 3! You should first check the User Manual whenever you encounter any issues with your Note 3. Samsung Galaxy Note 3 User Guide for SM-N900 and SM-N9005 is online now. You can download Galaxy Note 3 User Manual (in PDF) in different languages. 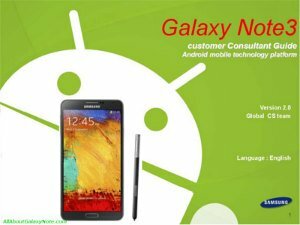 If you do not want to download the PDF file, you an read Galaxy Note 3 User Manual online with our embedded Google Document Viewer. Galaxy Note 3 Customer Consultant Guide is the Bible for staffs in Samsung service centers. The Guide gives lots of inside information, tips and tricks, FAQs of Galaxy Note 3. Get the most from your Note 3 once reading this guide. You can download Galaxy Note 3 Customer Consultant Guide now or read it online. Galaxy Note 3 Online User Guide (HTML version) will be online soon! Very bad i have GALAXY NOTE 3 (SM-N900) AND Shocked that there is no FM radio Provided. Without FM Radio, it is worthless. Samsung stopped providing fm radio on ALL LTE enabled devices. You have to use online radio. Yes, Samsung nowadays is a bit drunken. Our Facebook page || Galaxy S9 Guides || Galaxy S8 Guides || Galaxy S6 Guides || Galaxy S7 Guides || Android Nougat Guides || Chromecast Guides.